My wife and I were looking for some information recently to open a checking account for her. Although I am happy with the place I bank at, we wanted to see what other options we had to open an account for her. We were interested in looking for one that offered services like Debit Card rewards program & one that didn’t charge for using other bank’s ATM. When I opened my current bank account, I just went to the bank websites which I knew were in my area and looked for some information about various accounts they offered. Sometimes they were easy to find and sometimes they weren’t. Sometimes I would call the local branch to get information on their offerings. I didn’t know that some banks had so many branches around town just because I hadn’t noticed them at all. You just give your street address and zip code and choose an optional distance you want to look up banks in. Here you get to specify what kind of features are important for you and you have three options to choose from – Don’t care, Nice to have or Must Have. You can influence your results by choosing an appropriate answer for each feature. It also has helpful description if you aren’t sure of what something is. 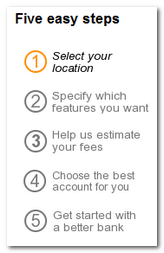 Now you are taken to page that lists the banks that matches your selection criteria sorted by estimated annual fees. It also shows how closely every account matches your preferred features in percentage. It also shows how far the closest location is for you as well as shows the number of locations within 10 miles of your address. If you’d like to see individual features and fees for the banks listed, there are a couple of tabs at the top of the table to easily switch views back and forth. On choosing a bank of your interest, you’ll see extensive details about taccount you are looking at and contact information. It even has a Google Maps link showing the closest location in a bank. With this cool wizard, it was easy for us to see which account matched our needs the closest and made our decision-making in a usually painstaking process, a breeze. With more banks being added every week to this tool so with time I see it as being an authoritative entity in this niche. 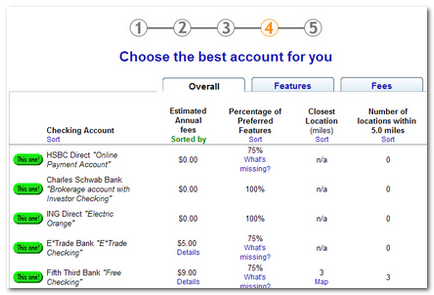 This is a simple and effective tool that answers a most sought question by most consumers shopping for a bank account. The interface is not your flashy web 2.0 kind of look and does not have a funky logo but it is designed to be easy to use and it does the job very well. How would you go about hunting for a bank account usually? Thanks for noticing (and writing up) FindABetterBank. We launched the website on Feb 1 and it’s exciting to see people using it. In March, we’re going to begin publishing interest rates and information on linked savings and money market accounts. Also, once you open your new account, visit http://www.bankswitcher.com for help switching direct deposits and automated payments. Been looking for a post like this for online banking. Go for it. Nirmal.. sorry! I should have mentioned that it is US only. This is a very very cool idea. It reminds me of lowermybills and sites like that but it compares features instead of perks and interest rates. I love it! K, Just wanted to post an update and say that I actually found a better bank at the web site mentioned. Thanks for the post.